On a visit to the Berlin Zoo last month, I watched primates interact with a cleverly-designed game called a poke box. It’s a plexiglas enclosure with shelves. Rows of holes in the enclosure give access to the shelves. Each shelf has a single hole, offset from the holes above and below. The machine drips pellets of food onto the top shelf. The primates, using sticks they’ve stripped and prepared, reach through the holes and tease the pellets through the holes in the shelves, performing one delicate maneuver after another, finally reaching through a slot in the bottom of the enclosure to claim the prize. How would I perform in a game like that? My hunch: not much better or worse than a group of bonobos I spent a long time watching. 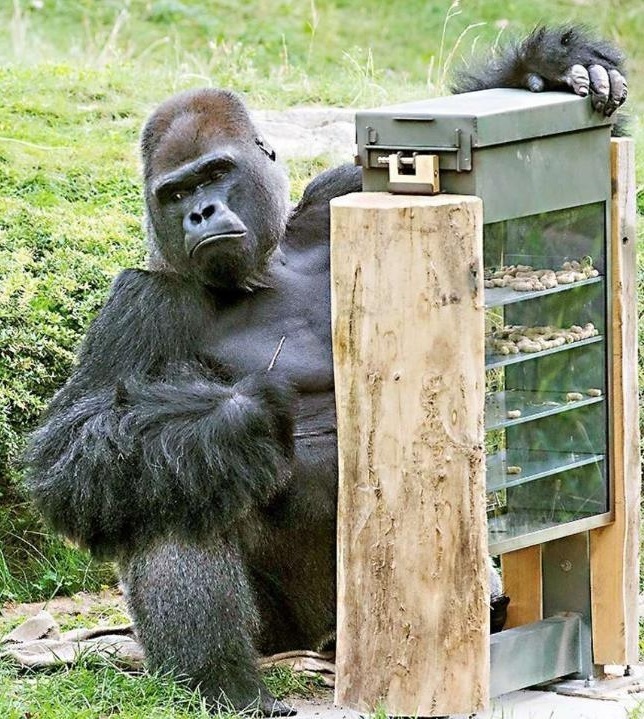 “This so-called behavioural enrichment,” the Zoo says, “is an important area in animal management.” The poke box is undoubtedly enriching the lives of those primates. But they are still prisoners. My dad was a volunteer at the Philadelphia Zoo. I saw, growing up, how that zoo tried to create more naturalistic settings for its animals. The most successful I can recall was the hummingbird house. Its tiny inhabitants roamed freely in a large open space that looked and felt like a tropical rain forest. I don’t know if those birds really lived something like a normal life, but it seems at least plausible. I can’t say the same for most of the animals I’ve seen in zoos. Conditions may have improved over the years, but I’m not sure I’ll ever again pay to watch the prisoners perform “enriched” behaviors in “naturalistic” settings. If my children were still young, that’d be a hard call to make. A visit to the zoo is one of the great experiences of childhood. If there weren’t zoos, how could we replace that experience? Maybe we don’t need to jail animals. Maybe we just need to improve our ability to observe them in situ. There’s still plenty of open space that is, or could be, conserved. And we’re getting really good at surveillance! Let’s put our new skill to a different use. Fly cameras over areas of wildlife parks inaccessible to tourist vehicles. Enable online visitors to adopt and follow individual animals and their groups. Make it possible for anyone to have the sort of experience Jane Goodall did. The drone cameras sound creepy, but unlike the vehicles that carry tourists through those parks, the drones will keep getting smaller and more unobtrusive. Could it happen? I’m not holding my breath. So for now I’ll focus on the wildlife I can see right here in Sonoma County. This spring we discovered the Ninth Street Rookery, less than a mile from our house. Each of the two large eucalyptus trees there is home to about a hundred nests in which black-crowned night herons and various species of egret — great, cattle, snowy — raise a cacophony as they raise their young. We visited a couple of times; it’s wonderful. Although, come to think of it, if it were a channel on cams.allaboutbirds.org I could watch and learn a lot more about the lives of these animals. And so could you. Author Jon UdellPosted on 4 Jun 2016 Categories . When you mentioned your kids, I thought for sure you’d compare zoos to schools, with equivalent “enrichment” programs for greater “engagement” and “stimulation”. Ha! I don’t feel quite the same way about schools, but point well taken. To be fair to the more advanced zoos in many cases they are focusing not so much on exhibiting animals (although that is certainly a money generator) as on various conservation related activities. So they are trying to focus on animals that have to be bred in captivity because the wild populations are in immediate threat of extinction. My local zoo, the Woodland Park Zoo, for example has a long list of animals that it maintains that are endangered – http://www.zoo.org/conservation/endangered. If the zoo wasn’t breeding them then we might lose them all together. And while it’s true that some animals just aren’t fit for some zoos (again, my local Zoo got rid of their elephant exhibit for this reason – http://www.zoo.org/document.doc?id=1456) many animals are. So I wouldn’t throw the baby out with the bathwater. Zoos can be ethically run.